I broke my unity by using cairo dock PPA, how do I fix it? I have recently installed Ubuntu 12.04. I had installed Cairo-Dock as well. My brother closed something in Cairo-Dock, He doesn't know what exactly he did as he is new to Ubuntu. After he did that, The Unity panel is completely missing. Even the launcher is missing. The Cairo-Dock panel is also missing. Okay. It seems like your brother disabled or played around with the unity plug-in. If you have CompizConfigurationManager installed,open it. Or else install it from the Software Center. 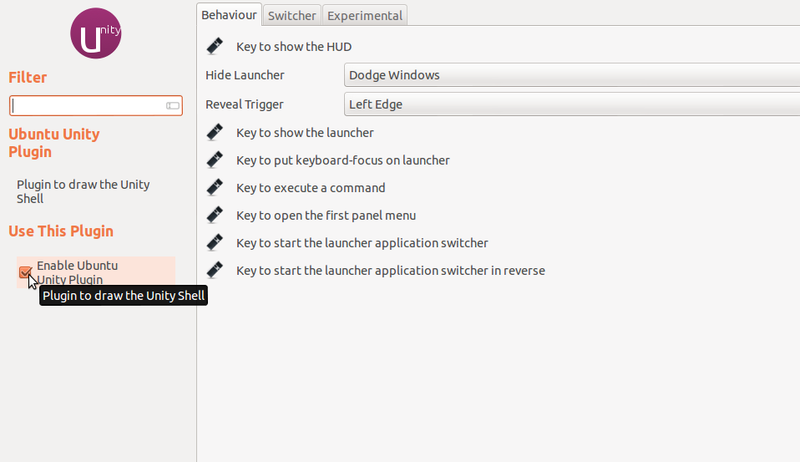 2.In the Settings click on the Enable Unity Plugin option.! Look for the Unity plugin and enable it. Not the answer you're looking for? Browse other questions tagged unity 12.04 cairo-dock or ask your own question. cairo dock cant find plugins? How can I only disable unity panel? How do you keep Unity Panel while using Cairo-Dock on 12.10? How to create a custom launcher in Cairo Dock? how to make apps minimize to dock?